How should I start working with dads? What in the world should I help them with? What is a basic resource I can use that provides a way to talk with dads about the issues that matter most to helping them become more involved in the lives of their children? In the span of our 20-year history, the National Fatherhood Initiative® (NFI) staff has received the above questions - and more - from practitioners, staff, and fatherhood mentors who work with and for organizations in every setting imaginable. They've called and e-mailed us, attended our presentations at conferences, and participated in our capacity-building workshops and training institutes on our curricula. Have you struggled to find a resource that can guide you in having discussions with dads at any time and in any setting? Do you work one-on-one with dads and need a resource that's more robust than a brochure? Do you make presentations to dads in the community, such as at schools or businesses/workplaces? Do you conduct home visits with parents and need a resource to help you engage dads? Do you just not have the time or resources to conduct an intensive, group-based program for dads but still need a resource that can help you facilitate a short group discussion? Do you use a NFI group-based program or workshop and need an additional resource to delve further into some topics with some of the dads one-on-one? Enter our newest resource, 17 Critical Issues: A Guide for Practitioners and Staff to Use in Presentations, Home Visits or Meetings with Dads which provides an answer to these questions and more. At just $39.99, this guide can be implemented immediately in your organizational setting or discussions with dads. Led by NFI President Christopher Brown, an applied anthropologist with more than 20 years experience designing fatherhood programs and resources and studying fatherhood and masculinity cross culturally, our team has identified 17 critical issues (hereafter referred to as topics) over the years that are critical to address when assisting fathers of any race, ethnicity, or socioeconomic background in becoming involved, responsible, and committed dads. 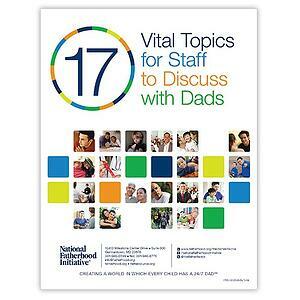 The simple structure of the guide helps you customize a discussion with dads in any way you want. Use the guide to design lectures, workshops, seminars, events, and other activities for fathers. Cover one or more topics at any depth you like, in any format you like, and within your time constraints. Use the guide to experiment with the topics, format, and discussion length that works best for you/your organization. Learn more or purchase your 17 Critical Issues Guide on our fathersource.org resource website today.